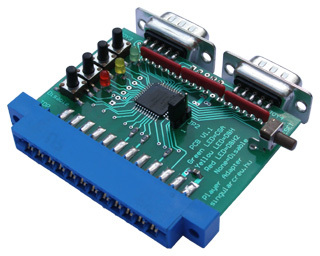 The Singular Crew 4 Player Adapter allows you to connect up to 4 joysticks to your C64, rather than the factory limit of 2. Even better, this adapter has all the features of every similar adapter and adds a few more extras to the feature set. Whether you are a gamer or game developer, this adapter brings new possibilities and a useful device to your C64 config. Big image / Extra big image. Classical Games Adapter (CGA); The Singular Crew 4 Player Adapter also adds support for the right and middle button of Amiga mice even in CGA mode. Our adapter is practically compatible with every game that requires one of the above listed adapters due to its configurable adapter compatibility modes. If you are a gamer, the Singular Crew 4 Player Adapter brings new entertainment to your C64, as this adapter lets you play every multiplayer game that supports any currently known 4 player adapter -- you no longer have to buy or build 3 different adapters to have access to all those games! At the link below you can find information about games supporting 4 player adapters, and now high-time for an info flash -- Singular Crew is working on more such games. Unfortunately, the device cannot detect from software. If you want to use software that is incompatible with devices connected to the USER Port, there is a Disable button right below the compatibility mode buttons. This will completely disable the adapter, indicated by none of the LEDs being lit. Additionally, there is a Reset button on the Singular Crew 4 Player Adapter. Besides the on-the-fly configuration options described above, you can set up the Singular Crew 4 Player Adapter to be in a particular mode after you reset the C64. Jumper JP2 lets you select if resetting the C64 should switch the adapter to Disable mode or to keep the previous mode. Disable after reset is the best generic setting because the Singular Crew 4 Player Adapter is constantly signalling the C64 while active, and this may incur a problem if some software attempts to use the USER Port as an output (ie. a fastloader for floppy drives with a parallel cable). Such situations can wreck both the 4 player adapter and the C64. The Singular Crew 4 Player Adapter has a certain level of built-in protection against situations like the user selecting the wrong compatibility mode for a game requiring a 4 player adapter, some software trying to output data via the USER Port while the adapter is not disabled, or a USER Port I/O programming error while developing 4 player adapter support. Nevertheless it is best if the user takes precautions and heeds the following directives while using the adapter. - Plug the adapter into your C64 with the LEDs and buttons on the adapter facing the same side as the Power LED and keyboard of your C64. - Never attempt to plug the adapter into a switched on C64! - Select the compatibility mode suitable for the 4 player adapter supporting game you are running only after the game was launched. - Make sure you selected the proper compatibility mode for the 4 player adapter the game actually supports; if you selected the wrong mode, switch to the proper mode as soon as possible or press the Disable button on the Singular Crew 4 Player Adapter. - Only one-way communication (adapter to C64) is supported by the Singular Crew 4 Player Adapter. Never attempt to program the joystick ports of the adapter as outputs!